Of all the essential gear that you need indispensably to make your winter hunting expedition or mission successful, a pair of sturdy and resilient cold weather hunting boots is one of these. While you’re out game hunting in chilly or frigid weather, you not only need to be nimble-footed but also have to be steady on your feet. In such a scenario, only the best cold weather hunting boots will come in perfectly handy, letting you effortlessly dart from one location to another, and position self stably when aiming as well as protect your feet from frostbite, injuries, and trauma. There’s no disputing the fact that a pair of best cold weather hunting boots is a must-have for any game stalking or hunting trip that you undertake, especially during the winter season. But the task of choosing a quality cold weather hunting boot pair can be quite daunting and cumbersome, given the nearly countless number of brands available, where each claims to be better than the rest. This blog, which first outlines the basic features of a best cold weather hunting boot pair, and after that reviews six topnotch brands, will help you to pick and choose a product that you find appropriate. For a start, no matter whatever brand you buy, make sure that the same is a perfect fit, keeps your feet comfortable throughout the trip, lets you move swiftly, and is stably constructed for long-term use. You can refine or fine-tune your search if you explore different products based on your hunting style and preferences. Another aspect that you must ensure is that the boot pair should be waterproof (or at least water-resistant) since you’d be hunting in the thigh or knee-deep snow on numerous occasions. Of course, there are various other factors that you’ll also need to keep in mind. Do you prefer to set your sights on a game by planting yourself in a specific position (like on a tree stand or a tripod stand) or opt to be itinerant during a typical hunting outing? If you like to be sedentary, then you should go for the best cold weather hunting boots that are heavily insulated, products which are rated more than 1000 Thinsulate. ‘Thinsulate’ is a synthetic fiber thermal insulation brand, and the expression is a combination of the words, ‘thin’ and ‘insulate.’ The material is identified by its trademark, 3M, and higher the Thinsulate rating of the product, the better is its insulation capacity. Hunting boots with a Thinsulate rating over 1,000g will keep your feet thoroughly warm and snug while you perch yourself in freezing weather. Alternatively, settle for hunting boots with a Thinsulate mark of 800g or thereabouts for promoting moisture wicking to keep the feet dry that tend to get wet and sweaty due to your ambulation and also because of dew or condensation. At the same time, see to it that the boots are constructed from material or materials which make the footwear lightweight as well as keep your feet breathable. After all, you’ll need to ambulate with ease when you’re wandering in snowy or muddy terrains, and heavy boots could prevent swift movements. The long and short of it all is that if you want to be in your elements when game-hunting, you’ll be playing it safe with boots having leather uppers and rubber or neoprene out-soles. This aspect more or less follows from the above mentioned factor. The best cold weather hunting boots usually have an upper stitched out of a premium grade of leather and outsole carved out of neoprene or fleece. Boots constructed from these materials tend to stay functional for years, offer good traction, stimulate ventilation, thus keeping feet cozy and warm, and remain silent which is crucial, mainly when you’re stalking. That said, you’ll come across a range of brands made from a combination of leather and rubber materials. But on the flipside, such boots will be much heavier than you’d like them to be. So, you should filter your search by searching for a model whose components are made from the above materials yet does not compel to drag your feet every time you make a move. Preying on deer, antelopes or wild boars during the winter months implies trudging through or standing on several feet of ice/snow that ultimately results in moisture seeping inside your boots. Catching a cold or suffering frostbite is surely the last thing that you’d want while you’re out hunting. So it does not need to be exaggerated that you should always choose boots fabricated from materials that do not soak in moisture or water and also insulate your feet from the numbing cold. Keeping feet comfortable, warm, and dry is crucial if you wish to return home with a game at the end of your hunting expedition. Hunting boots featuring padded insoles and heel arch, cushioned collars, tongues, and foot bed will go a long way in keeping your snug and comfy for the entire duration of your trip. Boots with outsoles featuring grooved ruts and patterns furnish solid traction on rugged and slippery terrains. 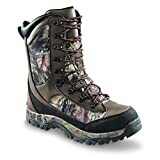 Make sure you pick up winter hunting boot pair that is at least one or half size bigger compared to your normal size. This is so because you’ll be wearing thick woolen or cotton socks during the cold weather that will take up more space inside the shoe yet leave sufficient room for wiggling your toes. The MuckBoots Men’s Arctic Pro Hunting Boot has everything going for it to be eligible for the ‘Best Cold Weather Hunting Boots’ tag. For a start, the boot pair has been chipped out of superior grades of fabric and synthetic materials. You can effortlessly slip your feet inside the boots, thanks to its ergonomic design. The waterproof shaft keeps water from entering inside, and the stretch-fit profile of the upper means your foot sits comfortably. The 2mm thermal foam padding helps ensure that the boot absorbs and nullifies shocks and impacts resulting from moving on the jagged or uneven surface. The padding also keeps the foot warm and cozy. The molded outsole has rounded and quadrilateral ruts that provides sound traction when you are trekking on slippery surfaces. Double reinforcements at heel, Achilles, and instep boost stability and comfort. Lacrosse is one brand that enjoys solid goodwill in the market for ‘best cold weather hunting boots. The Men’s Meta-Pac Ap 16” Black Met/At Work Boot is a fitting testimony to the high level of craftsmanship that Lacrosse has achieved when it comes to designing quality winter hunting boots. This boot pair seamlessly blends good looks with versatility-the jet black hue with interlays of radiant yellow on the uppers easily attracts your attention while the construction from premium rubber ensures a lasting functional life. The extent from the toe region to the arch is about 16 inches, providing more than enough room to comfortably place your foot. The heel stands approximately 1” from the ground, giving you firm equipoise, and together with the ribbed patterns all around the outsole, offers you good grip in all hunting situations and circumstances. The toe area is remarkably broad, making for sufficient wiggle room. The opening is about 15.5” all around which permits easy slipping off your foot as well as pulling it out. The insole is fully removable that helps in dusting and cleaning it. The Men’s Arctic Hunter II Insulated Waterproof Boots from Guide Gear is up there with the best cold weather hunting boots, and for good reasons. The Arctic Hunter II fully exploits the 2000g Thinsulate rating, guaranteeing that your feet stay completely dry, warm, and comfy even when you’re in the Arctic or Antarctic. The footwear has been shaped out of extremely durable and hardy elements that enable you to put on the boots for countless hunting missions. At the same time, the intrinsic quality of the materials used for producing the boot pair also makes them thoroughly waterproof. 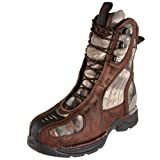 So, can you safely put on the Arctic Hunter II without having to worry about water or snow percolating inside the boots? The outsole is thick and tough with rut patterns throughout that improve traction on any surface. The abrasion-resistant cap adds to the hardiness of the boot pair. The gusset-styled tongue checks the seepage of snow, debris or water, and cushioning on the insole, collar and tongue help keep your feet cozy and relaxed. 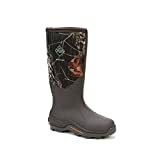 The Unisex Woody Max Boot is another quality offering from Muck Boot that is ideal for putting on almost all hunting modes or techniques. The boot has been cobbled out of textile and rubber materials with a fleece-lined outsole, making the footwear a highly sought after gear amongst huntsmen and game stalkers. The neoprene uppers together with a molded base are very stretchable, enabling you to transform your trudging on any surface into cakewalks. Additionally, the boot comes with a nylon-draped shaft coupled with 5mm CR flex-foam, makes the shoe fully waterproof, flexible, and lightweight. The stretch-fit calf hugs the calf that preserves the warmth inside and keeps the cold outside. 2mm thermal padding around the instep area furnishes extra warmth and coziness. The outsole, molded with MS-1 material transfer aggressiveness, durability, and toughness to the sole, thus ensuring maximum stability and safety. There are furrows on the base of the outsole which boosts footing. The Danner Men’s Blade GTX 8” 400g Motrstnd Hunting Boot not only appears eye-catching but also scores high on the performance front. The GTX 8” is surely one of the most comfortable and lightweight boots you’ll come across, and regarding performance, it is akin to a super light running shoe. The upper of this men’s hunting boot from Danner has been carved out from 100% authentic leather and Cordura-a very hardy synthetic fabric. The fabric has a meshed texture which supports the circulation of air inside the boot, thus keeping your feet dry and preventing foul odors. The gusseted tongue and collar together with the strong and flexible laces let you put on the boots as well as take them off easily. There is 8.5” padding on the arch, ankle, tongue, and collar, enabling you to position your feet comfortably and keep them cushioned as long as they’re inside the boots. The toe region is broad and quite flat which offers sufficient wriggle room for your toe. The materials used for cobbling the Blade GTX are highly resistant to chafes, grazes, abrasions, and tears. The Mossy Oak deer stand camouflage profile not only disguises the footwear in a way that makes it difficult for games to spot the same but also accentuates the boots’ appeal. The Men’s Alpha Lite Pull-On 16” boots by Lacrosse is synonymous with versatility as you can make the most of the footwear for a wide variety of applications including but not limited to winter hunting, farming, hiking, and trekking. Textile and synthetic materials have been used for producing the boots, thereby imparting incredible hardiness to them. The boots span about 14” from arch to heel which means the shoe can accommodate almost all sizes of feet comfortably. The signature Alpha technology that blends premium grade rubber and high quality neoprene with a natural insulation property, render the boot pair cent percent waterproof, extremely comfortable, and remarkably lightweight and hardy. Additionally, the proprietary ankle-fit layout helps position the foot top firmly as well as keeps the heel in place, thereby checking undue chafing or scratching. The Alpha Lite outsole with concentric rut patterns provides stable traction in muddy, slippery, and rugged terrains. So, there you have it- 6 best cold weather hunting boots brands-two each of Muck Boot and Lacrosse, and one each from Danner and Guide Gear. If you are looking for a pair that will come to your aid, whatever be your hunting style and remain in service for years on end, then you choose from the Guide Gear Men’s Arctic Hunter II and Danner Men’s Blade GTX 8”. Both these models come with leather accents that make the boots extremely effective. Alternatively, the pairs of Lacrosse and Muck Boot are also worth putting your money on.